Concept In this exhibition, the point of departure is the philosopher's room, in which the concept reflexive dynamics is central. On the one hand, this reflexive dynamics points to the dynamic relation between the various parts of the room. On the other hand, it refers to an emotional space that gives the viewer the opportunity to take a reflexive distance by means of a subtle play of colours. In this way, the installation becomes a poem with proportion. What is a philosopher's room? What is its relation with the person who occupies the room? And what is its connection to the outside world? Walls, ceiling and floor are all covered in black. In the middle of the room we can detect an object with the inscription 'me' – the one already used in the previous exhibition Wiederholte Spiegelungen – that is meant to function as a climax/anti-climax of the installation. Opposite the object is a projection in black/white of the faces of all the people who participated in website Corrido[o]r. What matters is the association of the visitor reading 'me' while seeing the projection of other people. If the visitor is by coincidence one of the people in the projection, it fits; in all other cases there is an ambiguity that allows for contemplation. In what respect is the person I perceive on the screen 'me'? What does the word 'me' refer to? Being the darkest room, it urges us to turn around and walk back through the installation – back towards the light. It is the room allowing for hope and testimony. The walls are coloured in 'Arti-blue' and there is a wooden floor. Blue spots hang from the ceiling. Large dark blue fabric covers one side of the room. Together with three folded packages of changeant fabric, it suggests a window to an ever changing present. Depending on the perspective the visitor takes, the changeant fabric is either reddish or turns into turquoise. Opposite the blue fabric, three square panels with blue pigment complete the room. The green room reminds one of a small house or a box and is situated in the middle of the large red room. Inside, it is painted black, with on one wall a green screen carrying the sentence: 'footnote to eternity'. A footnote is the place where culture and refinement survive, suggesting an eternity because of its open-endedness. In the middle there is a drawing of a staircase, leading the visitor to the 'forgotten dimension'. Surrounded by little green plants, the scene displays human creative processes. Many of the philosophers who participated in website Corrido[o]r mentioned plants as something they wished to be added to their rooms. I take it, that they longed for a creative atmosphere which unfortunately appeared to be absent. Some of them experienced the green house as something of a graveyard. Whenever the visitor enters the green room coming out of the red one, he experiences the drawing of the staircase as coming from the depths, upwards to the earth's surface. Should he enter the green room from the other side, it seems like the reverse: the staircase situates the viewer on surface level and directs him towards earth's depths. 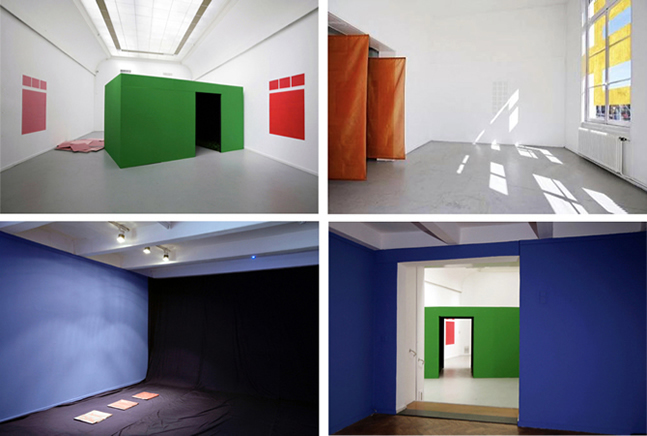 The green room is placed diagonally in the large red room, so that the visitor is forced to pass the opening of the green room if he wishes to continue his journey. During the preparation of the installation I had planned a second lowered ceiling in the red room, in roughly the same colours as the various 'windows' that were meant to cover its walls. Halfway through the construction of the installation it turned out not to be doable. At that point, I decided to let the process direct me towards a solution. I cut the 'lowered ceiling' into pieces and made it into a heap next to the green room in such a way that it blocks the passage for the visitors: now they are forced to pass from the red room into the blue room via the green one. The heap can be understood as the sketches and notes that were left out of the final work, but also as fragments, to be used for building up something that would 'finish' the installation. The solution proved to be much stronger than the original idea of the lowered ceiling. The walls of the red room are covered with nine abstract paintings of 'Vendel-windows' all in red shades, guided by rooms numbers that can be read at the same time as line numbers of a poem. The transition from the red room into the yellow room is marked by three orange pieces of silk fabric. The three high windows which provide a view on the centre of Amsterdam's every-day life are covered with yellow ribbons, painted in such a way that the outside world can only enter fragmentarily. Whenever the sun is shining, strong reflections on the walls and floor emphasise this idea of a fragmented, reflected world. On the wall, at the Laundry-side, there is a text-sequence showing the weather forecasts kept over the four years the project lasted. In the corner of the yellow room, an unfolded box shows the outline on a new perspective on the art of installation, originally planned to be placed in the white room. Thinking is time and again ... starting anew . . . This is the entrance of the exhibition space with a counter where visitors register and which has all sorts of information on contemporary art. It is the place of transition par excellence – where the real world transforms into a dynamic resonance and evokes contemplation over the values we assign to ourselves and that world.